I know I keep jumping back and forth between Fall and Christmas…and now I’m throwing Thanksgiving into the mix! (I’m actually just trying to keep you on your toes.) 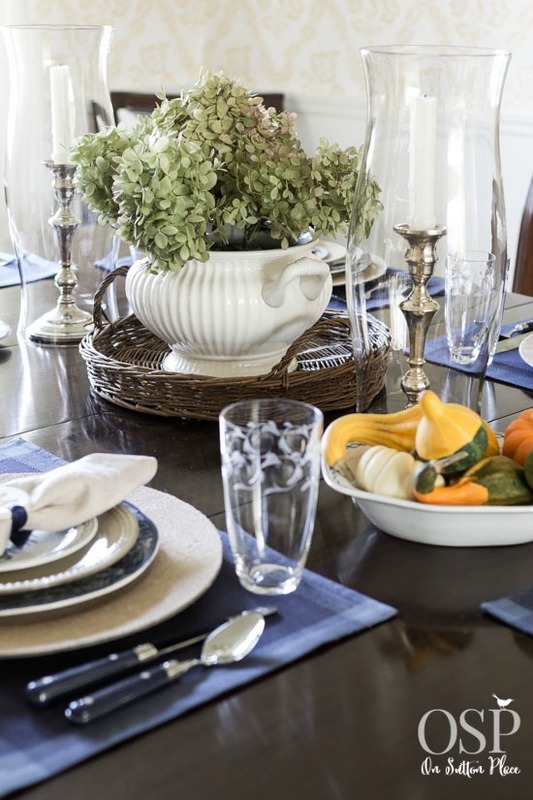 Anyway, today I’m sharing my Thanksgiving tablescape as part of the Thankful At Home tour. You might remember when I told you the story of our house during Hearts At Home and my summer story during Summer At Home. Like many of you, my Thanksgivings have changed through the years. In the early days, way back when, we ate a meal at my parent’s home followed a few hours later by a meal at my in-law’s home. Both places had lots of people, tons of food and the occasional political debate over dessert. We then transitioned into staying home and hosting the parents. Now, with my in-laws gone and my parents not able to get out, it’s going to be just us. My husband, my kids and my future daughter-in-law. I’m still hoping my daughter brings her boyfriend but I’m not sure about that. My point in telling you all this is that even though change is almost always hard, accepting it really does make it easier. I have pep talks with myself about this all the time. You see…I hate change. Probably more than the average person. I worked hard to establish “family traditions” but with all the changes in my family, I’ve watched them go flying out the window. So this is what I’m going to do. I’m going to try my hardest to make new traditions. I started this year by making monogrammed clay tags and using them as napkin rings. As our family grows, I’ll add to the collection and everyone will have their own place at our table. At the end of the day, the only thing that really matters is that we are together. Where we are, what we do and what we eat aren’t all that important. I know there will be years when we aren’t together and that’s all the more reason to embrace the times that we are. To say I am thankful for those times is the understatement of the year. They are, literally, what makes my heart beat. So this Thanksgiving I’m not going to think ahead to what may or may not happen next year. This year is all that matters. Live in the moment so to speak. I hope you do the same…because no matter what stage your family is in, I can guarantee there will be changes. Be thankful for today…be thankful for your time together and be thankful at home. *The links on this page lead to shops and websites (like Amazon) where I am an affiliate. Click HERE for my complete Disclosure Statement. **I made the clay tags but honestly, I winged it. I used a combination of online tutorials and I think they came out pretty good. Definitely something I enjoyed so if you want to give them a try start HERE. **I’ve had a few questions about the initial stamps used for the clay tags. They can be found HERE. I used THIS CLAY. I’d love for you to stop by a few of the other blogs on the tour. They are all amazing. Ann, you were inside my head on this one and you put things in perspective for me. I will definitely carry this post with me through the holidays and beyond. Thank you. Beautiful post and love your clay napkin tags- they are so cute. What? Future daughter-in-law? Somehow I missed this news so congratulations are in order, I think! 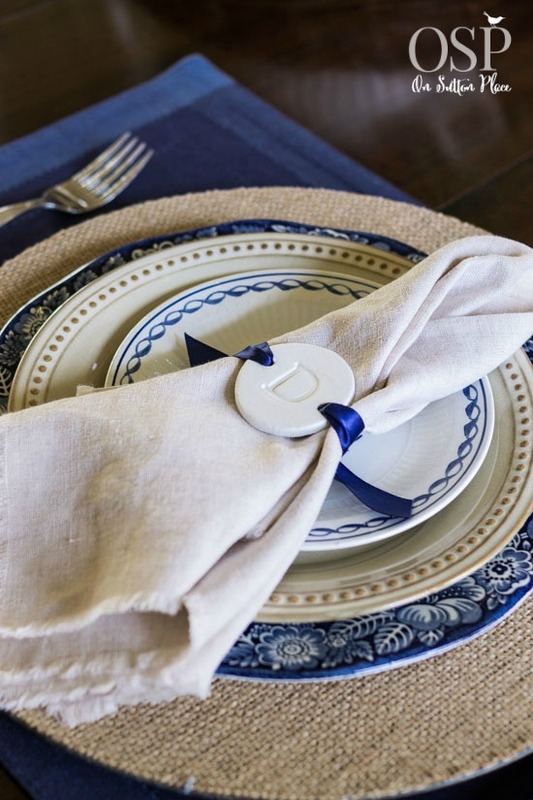 She will be so lucky to join your family at your beautiful table,complete with her own initialed napkin holder! Pinning! I remember Thanksgiving was always at my in laws house. They are both gone now, so it will be just the four of us. Love your clay napkin holders. Hi Ann- I have been following your Pinterest boards for quite a while and have finally come over to “meet” you! I so agree with trying so hard to make traditions that end up flying out the window. I have been in my marriage for about 7 years and as a blended family we have tried hard to make his and mine “ours”. But this year 4 of the 6 children can’t be here for Thanksgiving or Christmas so I am right there with you in trying to make it what it can be, get over my disappoint and start some new things. I am also following your posts regularly now. Thanks for the inspiration! Thank you for following along! I agree…no sense in pouting over what we can’t change. Have a wonderful holiday! Last year I had my old best friend over to cook Turkey & fixings. I made the dressing & pie the night before. She was in her element! Poured her glasses of wine and just watched a happy cook! ( I was dd) circumstances prevented our families to be there. So it was just us! We still talk about it. Beautiful Thanksgiving with an old friend. Your table is beautiful. I especially love the non-traditional Blues. We are having a big change this year for Thanksgiving. My daughter-in-law is having both families to her home for dinner. It is a big change as I am use to cooking for the whole week to get ready. I am going to relax and enjoy helping with clean up. Ann – Your thoughts have had a great impact on me, and I appreciate your clarifying what exactly IS important. It is about the here and now, and the time we have together with loved ones. It’s not about whether my house is perfectly decorated, or the how tender the turkey is. It’s about conversation, laughter, and love Thank you ! I enjoy your blog so very much, Ann! So many of us can relate to changes in family. I have difficulty with change but you have given me thoughts that inspire and let me be more open. Thank you for sharing and I wish much happiness to you and your family this holiday season. I love these clay tags and wonder if you would share the ‘press’ that you used for the monogram? I got the rubber stamps at Hobby Lobby and they are also available online. I admire your blog tremendously! I especially enjoy when you share your feelings regarding your family and the changes that occur over the years. Becoming an empty nester has been difficult for me. This is the first year both of my girls are off at college and my house seems so quiet and empty. Thank goodness my husband and my dog are here as we adjust to this new normal. Your home and projects are inspiring and lift me up on days when I am feeling down. Thank you! I couldn’t agree w/you more Ann. I know what you mean about family changes as our parents can no longer be with us, etc..We need to adjust and go on. As the years go on, I can see us added more friends to the holiday table which is fine by me. Thanksgiving is my favorite holiday meal and I love to cook it! 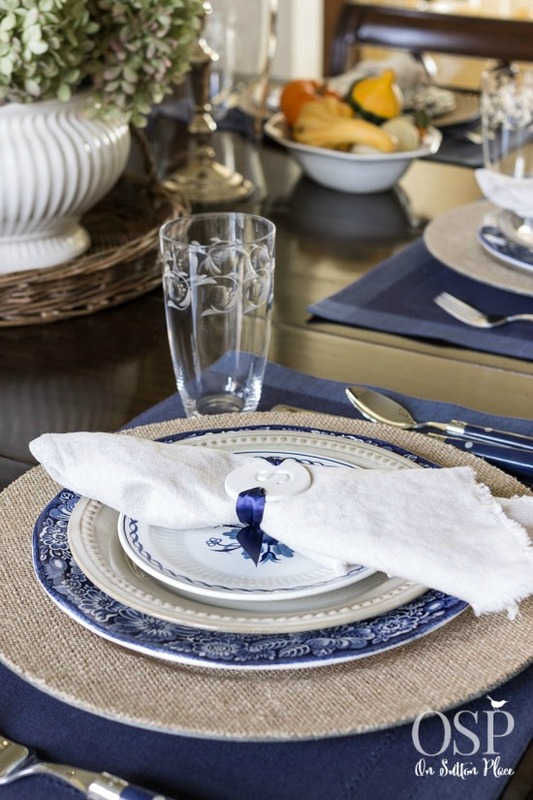 Great table setting and I may have to try the clay napkin rings…what did you use for the initial? I love your’s. It sounds like your family has figured out how to make things work. I am so glad! I love your tablescape! Traditions are changing for us slowly, but surely. I feel blessed for family and home, but great reminder from you to be thankful for the moment we are in. Thank you. it’s hard to embrace chance and the older i get the harder it is but we really have no choice, do we? i agree with you that since it is inevitable, we have to “go with the flow” or we get left behind. years ago we also had thanksgiving with parents and in-laws but then the roles reversed and we started taking turns at different homes. once mama was in assisted living, we ate out with her and everyone for 2-3 years but everyone wanted to start having it at a family members’ home again. this year is at my daughter’s house (she’ll be a month away from delivering her baby) so most of the “work” and cooking will be up to me. everyone else will be coming from out of town. i love your clay tags and your tablescape Ann! hope you have a wonderful and memorable Thanksgiving Day! You said it well…we have to change or we get left behind. Enjoy your Thanksgiving with your family! Beautiful table, Ann and yes, traditions change over the years. I hope you enjoy your smaller gathering. I always subscribed to the ‘enjoy every moment while you can because you just never know what tomorrow will brings it has helped deal with expected and unexpected change particularly when my niece died suddenly. I hope you start traditions that will make u happy for that moment . Beautiful table ann! Our Family Traditions, from my youth, have long escaped our home. give me such great comfort at the Holidays, but make our family uncomfortable. I, too, have learned that Thanksgiving is about who’s gathered around your table. attend her Family Reunion in a nearby town! Change is not always popular or easy to accept, but many times necessary. Blessings to you and those gathered around your Thanksgiving table, dear friend!!! Yes change is definitely necessary…and I hope you have a wonderful Thanksgiving! Your table is elegant and so are your thoughts. I appreciate that you shared them. I recall that dealing with changes such as these was one of my mother’s most challenging issues. Change must be a reflective process. It helps us develop deeper perspectives and keeps us moving. This is so true! We tend to think of traditions as things “we always do” but changes in the family forego those as time goes by. Love your clay discs! I usually do not leave a comment on blogs but just had to comment on your change in Traditions. I related 100% and love your comments on live this year and enjoy it in the now. I am sure many of us with adult children relate. I Love your table scape by the way. It is beautiful! Thank you for taking the time to comment Betty…Happy November! I try hard to not look too far forward, because it really changes today if I do. I’m with you. One day at a time and enjoy what we have right now. And what a gorgeous one you shall have! The layers… you do this like no one else! 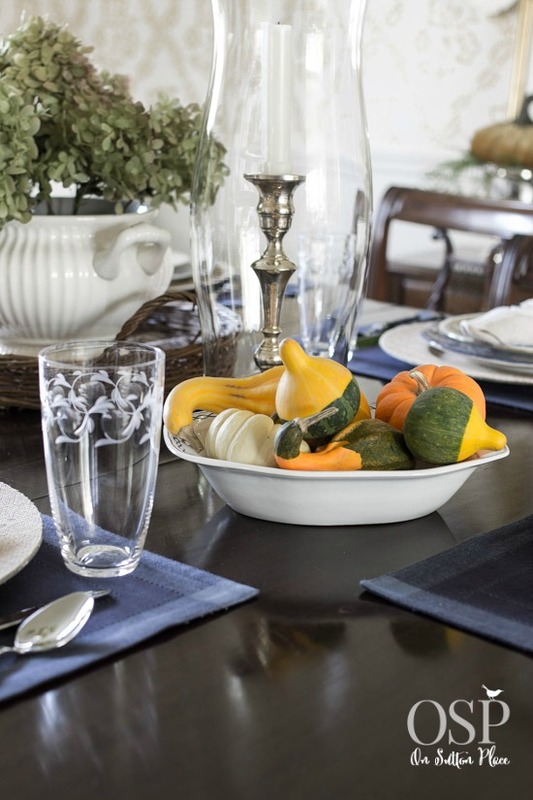 Your Thanksgiving tablescape is beautiful, Ann; classic and personal. I love the clay tags and the colors you have chosen for the dishes and placemats. I do miss our dear old house, especially at Thanksgiving, where we hosted Thanksgiving with our daughters and their families in our dining room. I would open the old oak table with 3 leaves and set it with a linen tablecloth and a mix of our white dishes with smaller plates that have a small fall scene. Now that we are in a much smaller home, we have Thanksgiving at our daughter Erin’s house, where the old oak table now resides, and she does a lovely job setting it with special touches. I don’t always like change, but it does come, and like you, I am so thankful for having our family nearby. Oh my gosh I think it’s wonderful that your daughter has your table…and that is as it should be. Enjoy your holidays! Very beautiful, hoildays are different with us empty nesters or those close to it. I am trying hard to find my happy place this year, both my grown boy’s had serious relationships with GF’s and then bam! Over, broken up. Everyone my age seems to be having their children getting married and having grand- babies and here I am- on hold. :( just keep telling myself good things come to those that wait! Happy Thanksgiving, enjoying your blog soooo very much. Enjoy this time with your boys! Break ups are never fun but I always tell myself it just wasn’t meant to be. Thank you for writing! Your blog is such a breath of fresh air, Ann. You have mastered the art of restraint–in your decorating AND in your philosophy of what really matters. Thank you for such a lovely post. What a nice thing to say Susan…thank you very much. It made my day! Ann, what a lovely table! I know exactly what you mean about “change”. As our family changes it’s hard to accept. Kids going to in-laws for holidays and those who no longer fill the chairs they one had! 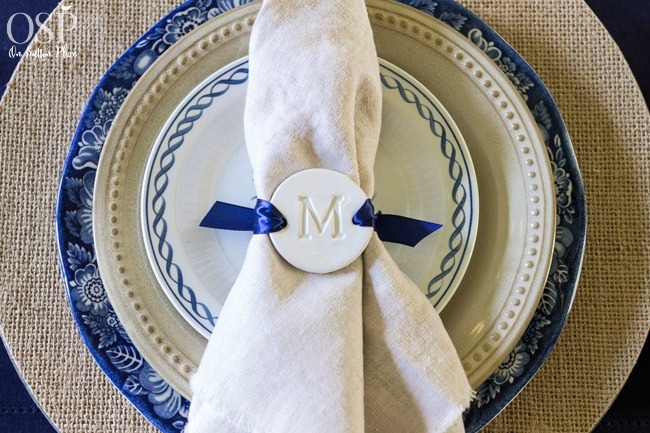 You table is beautiful and those monogrammed napkin rings are amazing! 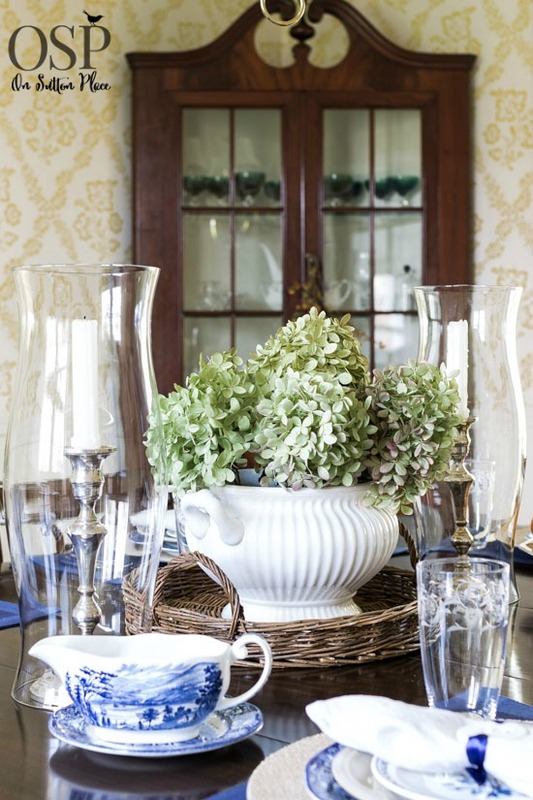 Thanks for sharing your pretty table and the gentle reminder to accept things and enjoy them. I need to do that every day!!! Unfortunately nothing stays the same forever, but as change occurs you’re best off to take it as it comes. You’re on the right track when you talk about living in the moment. Thank you so much for addressing this very heartwarming topic….for 31 years, we had Thanksgiving with my in-laws…and last year my FIL passed away on Nov. 12..and I hosted Thanksgiving lunch….I was so thankful to be able to be in my own home vs. a 7 hour drive away but it was different and people were not happy~but due to circumstances, it’s what we did. This year, we will all be scattered and I, too, am creating new traditions for my own Thanksgiving for my little family. I pray that we are all thankful that we are celebrating a season of Thanksgiving together. I appreciate the new ideas. Some years are definitely better than others…but it sounds like you are taking it all in stride. Thank you for taking the time to leave a comment! Time marches on and times and traditions have to change, don’t they? This year my husband and I will be spending Thanksgiving in Germany with our daughter, son-in-law, and first granddaughter. I hope someday to open my home again to a big family Thanksgiving, but for now, we go with the flow. What do I know? My son and his fiancée are spending Thanksgiving in Tokyo with friends! Your table is lovely, I always enjoy the glimpses of your beautiful home! I love the clay tags Ann! Someday you will see you kids carry out those very same traditions you gave to me them. I’m sure of it! Thanks so much for sharing about this Thanksgiving. Like you customs are in flux at our house. In fact, we are dining out this year. I say “Oh yuck” but it has opened up time for other holiday prep and pleasure. But seeing your gorgeous table I am missing decorating my own table this year. Yours is gorgeous! What a beautiful table. I love stopping by your blog first thing every morning! What a great attitude that accepting changes makes things easier! I loved this post, Ann! I love your honesty and how you speak from your heart. It’s always such a pleasure to have you on these tours — you get right to the heart of the matter! Your pictures are beautiful, I love your home and those monogram tags are fantastic! Great post, Ann. I think change is hard, especially when it comes to family traditions, but it seems you have the right attitude. Your table looks beautiful and I love your clay tags! Your table looks lovely. I’m breaking tradition myself this Thanksgiving. We are doing a buffet since there will be twenty-three family members. We will be setting four tables throughout the dining and living rooms. I do hope our Ohio weather will be dry so the men and the children can enjoy their football out on the back lawn. Oh a buffet is a brilliant idea…I hope the weather cooperates too! The same has happened with traditions in our family. We just try to make the most of it. Your table is lovely as always and I love the monogramed tags.